It's a frosty day out there tonight and I think only about cozy clothing to wear in the streets. In today's post I want you to have a look through these fantastic 30 winter outfit ideas for ladies. I am pretty sure you will never sacrifice with your style anymore, as I see many interesting style ideas what you can use in your everyday life. We see a hooded poncho worn atop black separates. I am so in love with black skinnies tucked in pointed-toe black leather boots. Of course, you might say that keeping up appearances is not an easy way when it's below zero, but don't panic dear, as I've got some stunning looks for you to share with. We see beautiful styles captured in the cities, like New York, Milan, Paris and London. Thanks to these 30 clothing combos ideas you are gonna get excited, as each outfit looks irresistible and totally wearable. 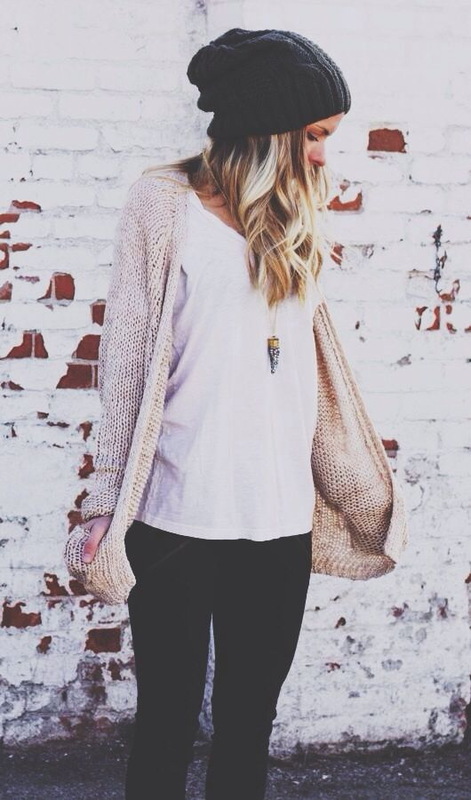 These are great ideas for women’s clothing. To prove a point, I made a bet with the wife that I can come up with a “clothing plan” for her for a week and it will be as good as what she can come up with. I like your idea of using a black leather jacket over a white tee. I think this will look great on her. I’ll see if I can get a similar one online. Wish me luck!